OCast. cochos, cocheros, Eng 1. cooked, boiled. 2. OCast cocha, Eng boiled food, stew. It is speculated that it has existed from Neolithic times when humans first boiled food in liquid. The first written record is about the Spartan black soup, in Greece, containing blood and probably vegetables. It is thought that scraps of meat were included. The Spanish cocido is believed to be a descendant of the Jewish dafina, see adafina. Like the dafina, cocido takes hours to cook. 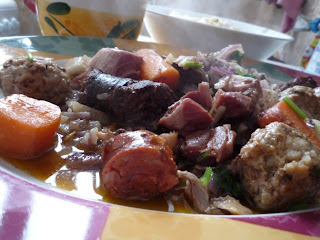 It has been maintained that it became a Christian dish during the 15th C, in Segovia, when products of the slaughter of pigs were added including blood sausage and chorizo, which stands to reason as Henry IV of Castile spent all the time he could in Segovia and loved sausages and other pork dishes. Segovia, also, is known for having some of the finest chickpeas, a basic ingredient in cocido. With the ascension of the Borbon kings to the Spanish throne, in the 18th C, French dishes replaced cocido until Alfonso XII had it served at his 19th birthday party in 1876. Then cocido made its way back into Spanish cuisine. Francisco Franco, Dictator of Spain, 1939-1975, while boasting Spanish moral after the Civil War ending in 1939, declared cocido a national dish. Now every region in Spain and every cook has his own recipe for cocido. 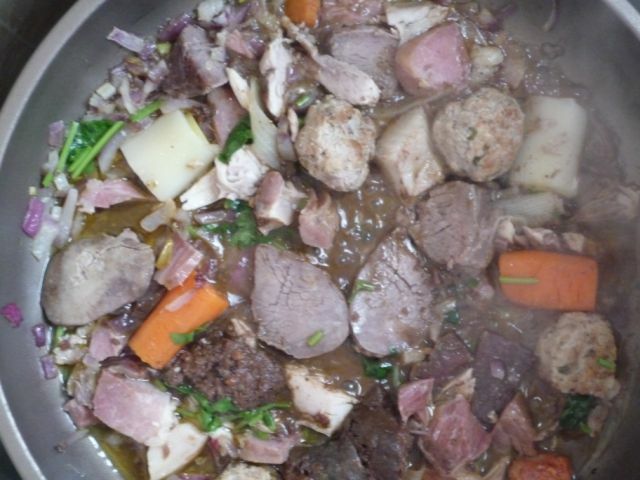 Normally, it includes pieces of chicken, osso bucco, pork sausage, blood sausage, salt pork, turnips, carrots, leeks and cabbage (which is cooked separately). Soak chickpeas overnight in water. Several hours before cooking cover the salted meat and the salt pork in cold water. A Cocido to Melt in Your Mouth! Fill a pressure cooker half full with water. Clean vegetables, except the cabbage, and wash the bones adding them to the pot. Bring the water to a boil. Place chickpeas in a linen bag and add them. Add the remaining ingredients except the chorizo and blood sausage. Skim off the scum, close the top and bring to a brisk boil then reduce heat and boil gently for 20 minutes. Mix ingredients for the balls. Shape them and set aside. Wash the cabbage and cook it in a separate pot for 20 minutes or until done. After 10 minutes add the chorizo and gently boil. Fry the blood sausage. When cooked, place it on paper towels to remove excess grease. When the cocido is cooked, each food item is placed separately on a platter, i.e. the carrots in one place, the chicken in another, the cabbage in another etc. (discard the bones). Remove the chickpeas and place them on the same platter. Add noodles to the broth and bring to a boil. 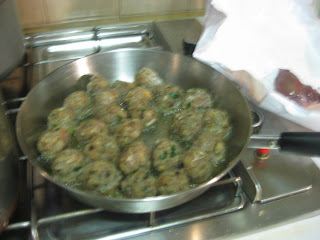 Fry the balls in olive oil and put them on the platter. When ready to eat, serve the broth piping hot with the noodles. 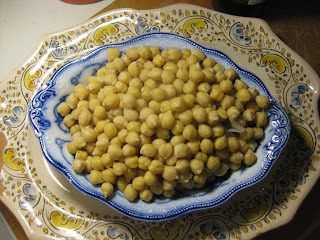 Drizzle a little olive oil over the chickpeas and serve with the solid ingredients on a platter. Orange carrots appeared in the Netherlands during the 17th Century. Today, they are used for color and are more common the white carrot, which was included in cocidos during the Middle Ages. Orange carrots were used in this recipe as white carrots could not be found. 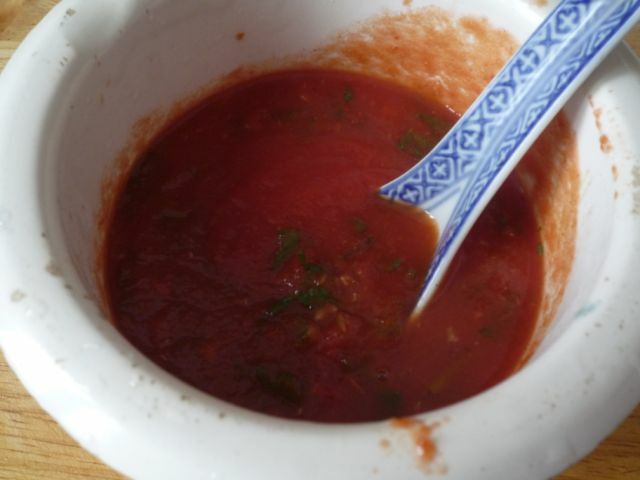 Today, a tomate sauce is served. MRSamper great granmother’s recipe is: tomato with a little broth, a mashed garlic clove, cumin and parsley.